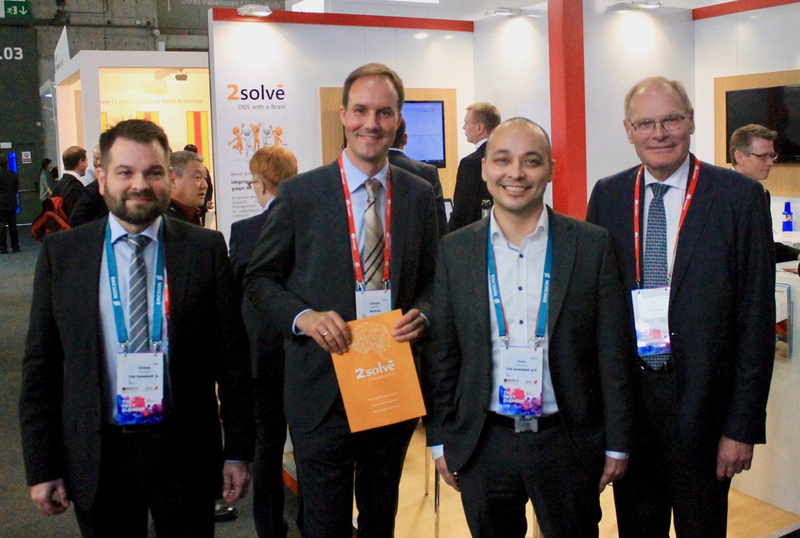 2operate and TELE Greenland have signed a contract for an Operations Support System (OSS) for simplification of network operations based on 2operate’s 2solve platform. The contract signing took place at Mobile World Congress in Barcelona on 28th of February. “It is very important for us to find the best solutions to ensure a strong link between network operations and customer experience“, said Jonas Hasselriis, CTIO at TELE Greenland. “2operate has developed an innovative product which increases the visibility of network performance to our operations and support organisation. This matches really well to our current strategy“. “We are extremely happy to close this deal with TELE Greenland here in Barcelona and we are looking forward to the new collaboration it brings“, said Christian Ingerslev Sørensen, CEO at 2operate. “TELE Greenland has in recent years increased its focus on customers and the customer experience. We wish to help facilitate that the customers of TELE Greenland experience an excellent network quality“. 2operate and TELE Greenland has previously worked together. In 2016 they completed a joint research project for the European Space Agency, ESA, on exploiting concepts from terrestrial telecommunications in the satellite communications area. 2operate provides a unique Operations Support System (OSS) solution, 2solve, using smart algorithms to boost productivity in Network Assurance processes. The solution reduces incident handling time by enabling personnel in both Frontline Support and Back Office to detect and diagnose network incidents faster. 2solve achieves automated incident diagnostics on top of vendor-specific OSS data by exploiting advanced statistical algorithms and pre-configured knowledge bases. Based in Aalborg, Denmark, 2operate has built a reputation for excellence and innovation. By working closely with its customers 2operate constantly seeks efficiency and simplicity in network operations. TELE Greenland A/S provides telecommunications, internet, and postal services to a population of 56,000 inhabitants spread over thousands of kilometers and great distances. Even the smallest village has radio, TV, telephony, and broadband internet. TELE Greenland A/S has around 440 employees. The headquarter is in Nuuk and sales offices are found in all towns in Greenland. For more information visit: www.telepost.gl.